“Can two truths co-exist?” asks Clare Flourish, examining whether atheistic and religious viewpoints can be harmious and respectful towards each other. I would argue that not only can they, for the sake of peace, they must do. Clare’s article comes from a Quaker Christian viewpoint, my own comes from my atheist philosophy. The first thing we have to ask is, to borrow the words of Pontius Pilate to Jesus (quite poignant as I write this at Easter), “What is truth?” Is there any one of us can actually define truth? I am not speaking of factual evidence, be it scientific or otherwise here, but truth itself. What is truth for Clare is not always my truth, nor mine hers. And for both of us, the truth of any other may not necessarily be truth to either of us, or our truths be true for them. Truth by it’s very nature is ever elusive. To explain, for a believer in God, the tenets of their religion may be truth. For me anything which can be demostrated, explained, and conclusively proven is one truth. In a more abstract sense my code of honour – that honour is more important than life itself – is another truth. And that life ends when no quality of life remains is yet another. The latter are points which many will find contentious, but to me they remain truths. This is an important point, especially where atheism is concerned. Contrary to what some believers may try to tell you, atheism is neither a religious faith, or a belief system. It does not even qualify as a movement, for unlike religious faiths, belief systems, or movements, atheism has no philosophy which ties those who identify as atheist together. There are no tenets, no dogma, no communion, no rules, and no real society. There is only one commonality which unites atheists, and that is we all agree that gods do not exist. But even that does not make for a shared philosophy, for every individual atheist has come to that conclusion based on their own personal observations and experiences. I personally never came to atheism until the age of 47, after a life of searching for spiritual fulfilment, which took me from Baptist Christianity to Wicca. To quote from the John Lennon song, I Found Out, “I’ve seen religion from Jesus to Ba’al.”, only to realise that I have never found any real evidence for the existence of god(s). And while many atheists have indeed left religion, there is not one will have had the same experience as mine, just as there is not one atheist thinks like me, or shares all of my views, just as I do not share all of theirs. Atheists tend to be highly individualistic freethinkers; way too freethinking to adhere to the diktats of another. We hear much today of the “New Atheism”, a term I despise and refuse to be identified with. Many who do are every bit as dogmatic, and every bit of a nuisance, as the religious zealots who try to force their particular faith upon you. In my experience the New Atheism is full of Dawkins clones who have read The God Delusion (or at least parts of it), treat it as their bible, and woe betide anyone who dares to disagree with the teachings of their new messiah. We, if I will not worship any god, then the Devil is going to be skating to work before I bow to the altar of Dawkins. Don’t get me wrong. It’s not that I dislike Richard Dawkins; I recognise he is possessed of a marvellous intelligence, and I respect and admire that greatly. Unfortunately, Dawkins also realises he is highly intelligent, but has failed to learn the humility which should accompany that. Smart he may be, but Richard Dawkins’ public persona to me comes across as arrogant, elitist and condescending, and he does neither himself nor other atheists any favours by the way he pours derision upon believers. Frankly, Dawkins to me is like that swotty, arrogant kid at school, who attempted to be teacher’s pet (although even the teachers didn’t like him), who would immediately tell on his peers, and who had that smug, self-satisfied face you just wanted so dearly to punch. And the same goes for Dawkins followers, who attempt to emulate his style and persona. Such “atheists” attempt to lay down rules and laws of what atheism is supposed to be. In another guise I am a paranormal researcher, and I have actually been told by some atheists that paranormal research is incompatible with atheism. Says who exactly? Consider the root of the word atheism; atheos – “without god(s)”. That’s all it means; nothing more, nothing less. Effectively anyone could believe in the Loch Ness Monster, UFOs and alien abduction, telekinesis, chupacabra, the Big Grey Man of Ben MacDhui, or many other things, but as long as they do not believe in gods, they remain by definition an atheist. But paranormal research does not mean believing, no more than researching the Bible, as I am wont to do, makes me a Christian. And this is where those atheists who deride paranormal researchers err; they assume that researchers must be believers, which is actually rarely the case. Most paranormal researchers are in fact atheists, or at least agnostic, for the simple reason we are the ultimate skeptics. We accept nothing at face value and will be the first to look for a logical explanation to any given phenomena. I personally adhere to the philosophy of Charles Hoy Fort, who believed that unless something has been conclusively proven, then all hypotheses surrounding any given unproven subject carry equal value. To put it in Fort’s own words, “One measures a circle beginning anywhere.” That’s not believing, that’s keeping a wholly open mind to all possibilities. Equally there are atheists who try to say that you cannot be an atheist and spiritually-minded or a believer in spiritualism, ghosts, or hauntings. Equally bunkum, as they are immediately equating these subjects with belief in god(s), Heaven and Hell, which may not necessarily be the case. As a paranormal researcher I would argue that given stories of ghosts and hauntings are common to all cultures and have been with us since mankind could first communicate, there is far too much evidence to dismiss the phenomena as delusion. And would suggest to even do so belies not only arrogance but downright ignorance. Again, to equate spiritual experiences with belief in god(s) can often be a mistaken assumption. But if any atheist still arrogantly thinks you cannot believe in spiritual matters and be an atheist, I suggest they tell that to the Buddhists, who have happily been recording ghosts, hauntings and other such spiritual matters, whilst having no creator gods for 2500 years. The bottom line of all this is that any atheist who tries to add these ‘rules’ to atheism and impose that upon other atheist, is not voicing atheism at all, but trying to enforce their own personal dogma, Just as some theists will try to enforce their own personal interpretation of scripture upon others. In short, they are attempting to impose their truths upon another. So, if atheists can research of even believe in esoteric matters, does it follow that theists can equally be freethinkers and enquiring scientists? Not only does that follow but down throughout history that has been an established fact. Galileo Galilei, Sir Issac Newton and James Hutton are just three examples of men of science who were equally very devout Christians. Most know of Galileo being forced to recant, but few are aware he was indeed a very pious man who was more angry with the intransigence of the church than being against them. Sir Issac Newton, who did so much to advance mankind, was also a noted theologian in his day. When James Hutton presented his paper Theory of the Earth to the University of Edinburgh in 1785, arguing that the Earth was extremely ancient, it caused an enormous rift between him and the Church of Scotland which saddened him greatly, and which never fully healed. For these men their scientific observations in no way disproved God, but rather they saw them as wonderful examples of a God-given creation. It was the churches being dogmatic which caused all the problems, just as it is with some churches to this day who take the bible to be a literal history and the irrefutable word of God – and exactly the same can be said for some Muslims and the Qur’an, and a great many other belief systems for that matter. We therefore see that it is not a case of whether we atheists are right and the theists are wrong, or vice versa. As with so many other things in life, it is both intolerance and disrespect for the beliefs and opinions of others which cause division where none should exist. As there are no two atheists alike, then it is imperative that we respect each others views, And likewise we need to listen to and respect the views of believers and we shall never do so while pouring derision on the beliefs of others, and dismissing them through unproven assumptions and accusations, Not believing in gods is one thing. Insulting, deriding, abusing, and / or dismissing believers is a completely different matter. Many atheists believe that all believers are suffering from mental delusions, while some others try to claim that religious faith is a mental illness. Figures vary, but it is reckoned that the number of those who have some faith in a god or gods worldwide, may be between 55% to 88%. Whichever, it can be safely said that the vast majority of people do indeed believe in god(s). And if that is the case, then that is one helluva lot of people who are either deluded, or suffering mental illness. And if it were mental illness, given that our ancestors were all believers, then any such instability could lurk within the genes of every atheist. Be afraid, be very afraid. I downright refuse to accept such an easy answer which ignores several other factors. To my mind to easily dismiss faith as delusion or mental illness smacks of the very thing myself and other atheists often accuse fundamentalist theists of; lazy and sloppy thinking. Such claims fail to take in historical, cultural and familial factors perpetuating faiths. Little Billy in Normal, Illinois, who goes to church every Sunday and knows he is saved through Jesus Christ, is really little different from little Achmed in Shaqra, Saudi Arabia, who prays to Allah five times a day. They both have their own truths, but culture apart, there is little to separate them. They are both being brought up in their respective faiths, to honour and worship God, as their respective faiths teach them to do so. And that is true for the overwhelming majority of believers in god(s). They follow the faith of the fathers because that’s what they have been brought up in, and have been taught all their lives that their faith is the one and only true faith. I really don’t think that many believers actually even stop to think deeply about the faith they have been brought up in, and whether it may be wrong. They just blindly follow, sheeplike. Not for nothing are the faithful referred to as “the flock”. Some atheists would call that indoctrination, and they may well be right. However, if it is, then it logically follows that to bring a child up as an atheist is equally indoctrination. Better surely to give each child a general grounding in world religions and atheism, and leave them to make up their own mind whether or not to follow a particular faith when they are mature enough to decide. Doing any other is not respecting either the child, nor the beliefs and philosophies of others. I can already see both theists and atheists throwing their hands up at that one, but I would ask you to think very deeply on this; if you impose your own philosophy upon a child, you are ultimately force-feeding that child your truths, and leaving them without the option to think for themselves, to make their own minds up, and discover their own truths. Some atheists ask whether we should even respect religions, and some downright refuse to do so. Their argument is that the religious faiths in the world have nothing of value to offer. I find such intransigence to be narrow-minded, arrogant, ignorant and confrontational. There are in fact many truths within faiths which are good guides for life, and which one need not believe in god(s) to follow. Christianity has given us the Golden Rule; “Do unto others as you would have them treat you.” Islam teaches that practising undue usury upon an individual is corrupt but charity unto others is fruitful. Hindu and Buddhist beliefs give us Karma – that we reap exactly that which we sow. Every faith teaches us to be respectful of our parents and elderly people, who having life experience, know better than we do. As a pacifist I have a particular fondness for the Quaker faith which Clare Flourish follows which advocates nonviolence. And of course, almost every faith on the face of the planet teaches the basics of the moral code; that killing, violence, stealing, cheating, and bearing false witness against another, are wrong, while showing kindness to others, and being forgiving, thoughtful and compassionate is morally right. And believers, you too need to give atheists some leeway. You cannot argue that morality comes alone from your God, because experience tells us otherwise. Morality is manmade and fluid, changing with time and between cultures, and one does not need to believe in god(s) to be a good person. The great many good and kind people who are atheists, humanists and agnostic are testament to that. Morality at it’s simplest level is a cultural concept, not a religious one. Likewise discussions with atheists should not be seen as an opportunity to proselytise, and try and ram your faith down the throats of others. Trying to push your faith on others just gets people’s backs up, and makes them more likely to react negatively than to ever listen to what you are saying. And nobody minds believers discussing science, so long as it is science. But start maintaining that your holy book is accurate history, despite scientific discoveries roundly dismissing them as mythology, do science badly, including twisting or even lying about what science and scientists say, and many atheists will switch off and dismiss you as a fool (not that you have to avidly study science to be an atheist – but it helps). This one will not. Try and tell me that Biblical creationism is true and evolution is false, then you and I are going to have problems, BIG problems. I maintain therefore that the truths within and without faith can and do co-exist, but it needs tolerance and understanding on both sides. Both theists and atheists need to be willing to listen to each other, to take on board what the other person is saying, debate it calmly and rationally as adults should do, and where there are disagreements, to show no malice towards the other person. The alternative is for each side to continue to dogmatically try and tell the other I’m right and you are wrong. Anyone, atheist or theist, who takes that tack is not only disrespecting others, they are immediately creating a confrontational situation which can only result in others going on the defensive. Any such are also not taking on board another possibility – that they may just very well be wrong. That is why we have to show respect to the views of others and learn that they may too have as many truths to teach us, as we have to teach them. Only by listening and talking can we only ever learn to co-operate and co-exist with one another. Illusrtation: What is Truth? 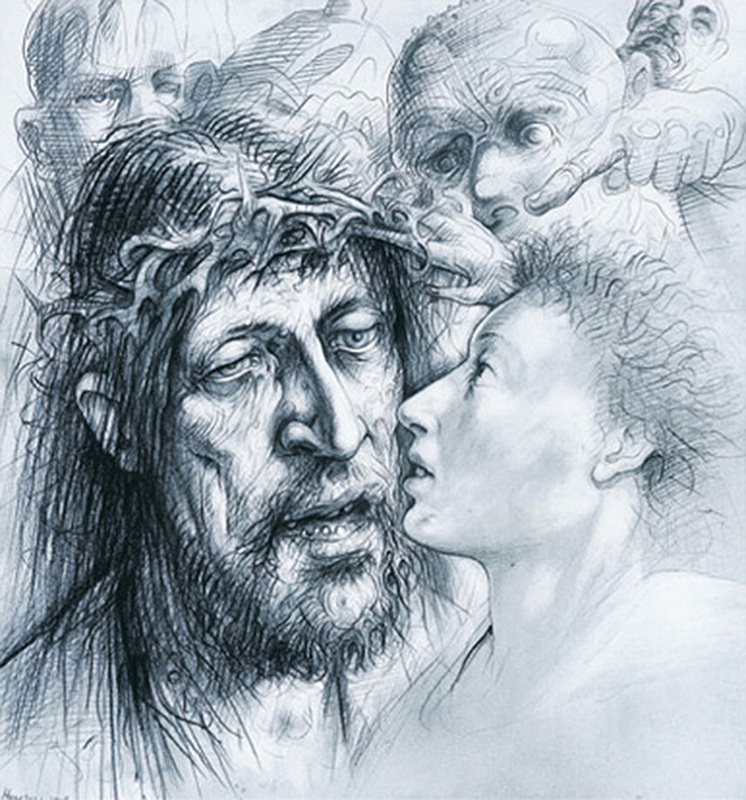 By Peter Howson.